Bonne année et bonne santé, as the French say! We've waved goodbye to 2017 and entered a new year, and what better way to celebrate it than observing the French tradition of l'Epiphanie - Three Kings' Day, on January 6th? While the north of France traditionally eats the Galette des Rois, in the south of France and in Provence, you're more likely to find families eating the ring-shaped Gâteau des Rois. 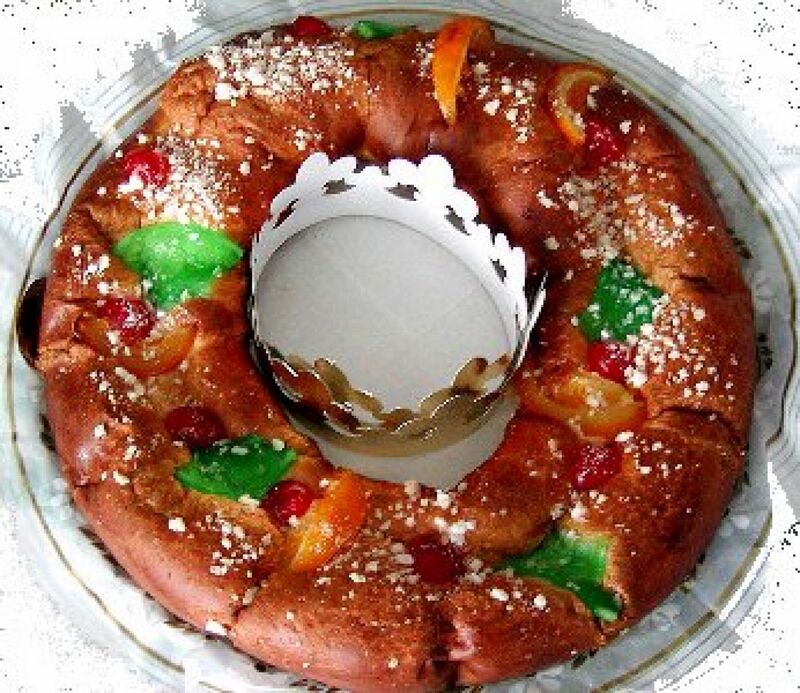 We've provided a recipe here for you to make and eat this traditional Occitan treat for yourself. Slice the orange without peeling, and boil it in water for 10 minutes. Discard the orange's water. Mix the sugar with 4oz of water until dissolved with low heating (this is very important - the sugar should not be caramelized!). Add the orange slices and keep in a pan covered with the low heating power for 1 hour; do not remove the cover from the pan, or the oranges will become hard! Afterwards, remove and place them on a plate to cool down. To make the marzipan, mix the almond powder with the sugar in a bowl, then add a little bit of water and keep mixing. If necessary add more water until you reach the marzipan consistency. Mix the yeast with 50ml of milk and 100g of the flour in a bowl. Keep it aside to rest for 1 hour. After letting it rest, mix the rest of the ingredients and add the yeast mix to it. Knead thoroughly for 15 minutes and let it rest for 2 hours. Roll out the dough in a line, then add the marzipan filling in the middle and roll the dough to keep in the marzipan inside. Curl the roll into a circle shape and place on the baking pan. Place the orange slices and glacé cherries on top and "paint" with an egg yolk. Let it rest and rise for 2 more hours. Bake in a preheated oven at 200º C for 15 minutes or until golden. Traditionally, in Provence, a dried bean is baked into the cake, and whoever gets it in their slice is crowned "king for the day". If you want to do this, put it in the marzipan before rolling up the dough. Otherwise, just dig in! Of course, if you're interested in more Provençal cuisine, we are running Provence tours - both Roman Heritage and Villages of the Luberon - in 2018, which are now available for enquiries and bookings for this year; we are running both tours from May to September.